DABANGG 2 glorifies the feel of DABANGG to another level, a meticulously composed album that tries to replicate/recreate the magic of its prequel with potential hit tracks. Lacking in novelty but still delivering bountiful in entertaining contents, Sajid-Wajid delivers a chartbusting album again. Unlike many recently released chartbusting albums that primarily targeted urbane-listeners, it targets a contemporary Bollywood listener and succeeds to great extent. The magic of romance continues to roll in tracks like ‘Dagabaaz Re’ and ‘Saanson Re’ while there is alluring massy catchiness in tracks likes ‘Fevicol Se’ and ‘Pandeyjee Seeti’. DABANGG 2 opens big on expectations on box-office and music too delivers what it promises, a total ‘paisa-vasool’ entertainment that is going to add to the joyride. Happy Listening! 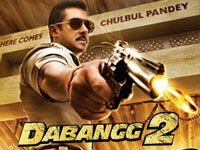 Dabangg 2″ is a musical delight with five original songs and three remixed tracks. Overall, the album scores well with the original tracks as most of them appeal to the listener. It’s however a miss as far as remixes are concerned. If one ignores that and considers the huge fan base that Salman Khan has, there is no denying that despite its shortcomings, the album will still be a hit. If Dabangg music established the parameters and rules of the game than Dabangg 2, sticks to the rules line by line and tries to match the original. It does succeed in quite a few places though for some the songs as heard in Dabangg may still remain favourite. People who are happy with the carbon copy won’t be disappointed as Sajid-Wajid achieve similar magic, if not in entirety. They have made sure that there is one corresponding track to the each hit one from the previous movie and now one waits to see Salman doing the rest by bringing on his own magic. Well, the music of Dabangg 2 is too formulaic and tries the same things that went into the making of Dabangg’s soundtrack. That said it’s massy and earthy and rooted in the ’80s, so there would be takers for it. Don’t look for another Tere mast mast do nain or Munni badnam hui and you won’t be disappointed.